Lately I’ve been disturbed, and frankly quite irritated, by a trend in which more individuals, either acting on their own or on behalf of their company, frequently send personal email blasts with no easy way to opt out. These individuals are likely empowered by new tools such as LinkedIn and customer relationship management (CRM) software, which make it easy to send emails to a large set of contacts. However, this practice can be damaging to you and your company, and I’d like to point out the reasons you should think twice before sending personal email blasts. Making your contacts’ day harder. There are myriad strategies which help people to clear out their email inbox to help them be more productive. 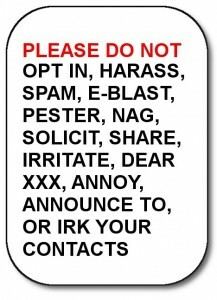 By sending your contacts unwanted emails which they can’t opt out of, you are making their life harder. They need to decide whether to mark you as a spammer, risking missing important emails you send, or determine how to politely decline the emails. Your contacts are one of your most valuable asset, and the absolute last thing you want to is be seen as making their day harder. You may be crying wolf. I will admit it…I have encountered the decision of either telling one of my contacts to stop sending me unsolicited emails a few times a week…or to mark the person as spam…and I did the latter. I may be missing emails from that person now, which is too bad, but they have my contact information and will call if it is important. Don’t put yourself in this situation, of having people ignoring or tagging your emails as spam because you are sending too many that are unrelated. As we talk about in our social media training and workshops, in this new media age it’s ‘not all about you’ and constantly sending mass, self-serving emails will brand you as someone who has little to offer. It may be more efficacious to build a big network or following and use more ‘soft sell’ methods like status updates to promote yourself. It’s easy to do it right. It is very easy to send emails including an easy ‘opt out’ using your CRM or email communication applications such as constant contact or mailchimp. We send most of our notifications to our contacts through our email application, always with the option to opt out. I will have to admit that LinkedIn makes it really convenient for us to send email announcements at times, but we don’t feel as though we abuse it. However, who knows, maybe some people are irritated with us (if so, leave a comment below ;). We should migrate LinkedIn contacts to an opt out version of communication (or hopefully LinkedIn and our email application will talk to each other someday soon). Bottom line? Don’t assume everyone on your contact list wants to hear from you often and indefinitely. Sending large scale personal emails on behalf of your company can negatively affect you both. What’s really dangerous about it is that if you damage your reputation, even on behalf of your company, it will follow you even after you’ve moved on.